We brought two iPads to Brazil. An iPad for Maicon and an iPad mini for me. I mean, we already had them in the States, but we knew they would be important tools in our "let's keep this new house uncluttered with toys" battle. Alessandra has since taken over the iPad mini because honestly these kids don't let me keep anything for myself. But it's worked out great, because now I have the Kindle all to myself to actually read books again. Both iPads have Garmin Survivor cases. (You can find them here. Again, no sponsorship.) We had a simple case on the mini while I was using it and surprise, surprise I dropped it and the screen shattered. Maicon's iPad has had the case from the beginning and has survived many plane trips, drops on the ground, and various liquids spilled on it. If you're going to put out the money for an iPad, you might as well put out a little extra for a cover to make it last. The other great thing about the iPads - iTunes gift cards! As I've posted before, there's always a giant fear about receiving a tax note on presents mailed to us, plus the cost of shipping for the gifter. (It's around $50USD to send a 4 pound/1.8 kg box to Brazil). My mom recently sent Maicon some iTunes gift cards for his 5th birthday and he was over the moon. We usually allow him to download free games, but ones that cost money are off limits. Knowing he could download almost anything he wanted (GTA is still off limits, sorry five-year-old) had him acting like he won the lotto. To the apps! We've always loved the iPad for our kids because there are so many games for them to play that teach them things. They think they're playing, I know they're learning, win-win. 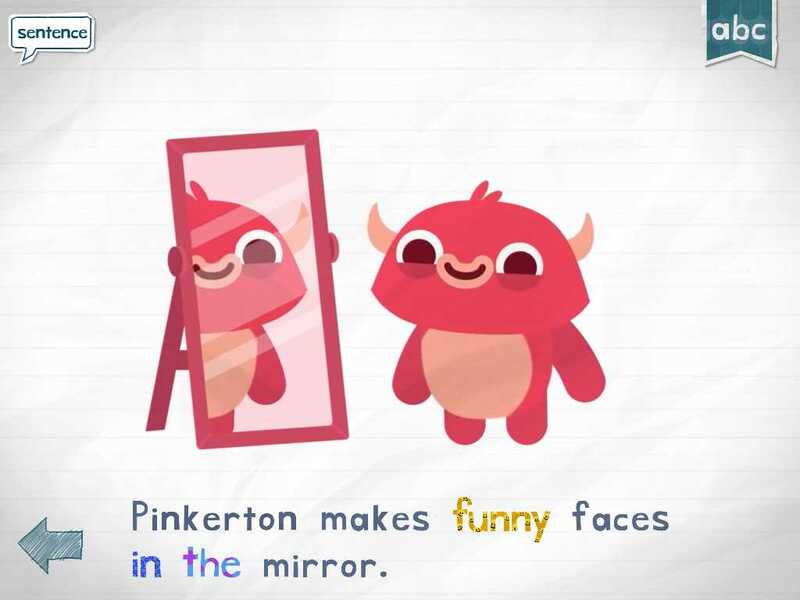 We are huge fans of the Toca Boca Apps. We have Toca Doctor, Band, Kitchen, Lab, Hair Salon, Hair Salon Me, Builders, and Cars. Some of them are free, some of them cost money. If you watch the app store, the Toca apps come up once in a while as the Free App of the Week. We try to hold off on the $ ones until they're free, although we have bought some in a bundle before. The great thing about the Toca apps is that they are so interactive they really allow the kids to explore their imaginations. They also feature a lot of puzzles and problem solving games that are appropriate for both our one-and-a-half year old and our five year old. 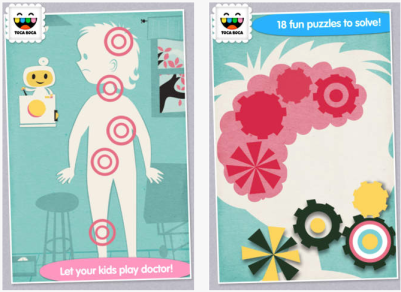 One of the Toca Doctor puzzles. They're playing and learning. Then there are the Originator apps. We love the Endless Reader, Endless Numbers, and Endless Alphabet apps. They can be downloaded for free, but there is a limited amount of free content. To access additional words/numbers/letters, "packs" have to be purchased. (This is where those iTunes gift cards come in handy!) These apps are amazing in a few ways. Colored and patterned words/letters/numbers jump around the screen, while the middle of the screen features an outline of said figure. The kids touch the colored figure and drag it to the outline. While touching the figure, the figure wiggles and verbalizes what it is in a really silly voice. For example, while touching the word "all," the figure says, "All! All! All!" Every time Alessandra touches one of the figures, she ends up in a fit of giggles. I'm always amazed when I watch this toddler who learned how to walk only 6 months ago, putting letters together to complete words. I know she doesn't understand what it all means yet, but it's a huge start. And since we don't have easy access to a ton of books in English (we did bring some with us), I love that Maicon has exposure to sentences in English. I'm hoping that these apps will lessen the learning gap when we return to the States. The colored words "funny," "in," and "the" bounce around the screen until matched with their outlines in the sentence. Finally, they both have the Netflix and YouTube Kids apps on their iPads. They don't typically watch Netflix on their iPads, but it has saved us from a few meltdowns about conflicting movie choices. I'm really not a huge fan of YouTube Kids because of how addicted the kids are. However, it does allow them to watch a lot of English nursery rhyme videos - things they wouldn't have access to otherwise. The popularity of the ChuChu TV channel is awesome because all of the videos have an Indian overtone (the team is based in India and run by Indians after all). Indian culture and identity isn't well infiltrated in the Western World, so I'm happily surprised that the kids have some exposure to it via the ChuChu TV videos. (You can read an older interview with the ChuChu TV team here.) And no YouTube Kids review would be complete without mentioning my "Family Finger song" PTSD. If I never heard it again, it would be too soon. Moms, dads, you know what I'm talking about. If you know of a petition to have the Family Finger songs banned from YouTube, pass along the info. I will gladly sign!